After first discovering these, I think around a year ago I have become a huge fan! 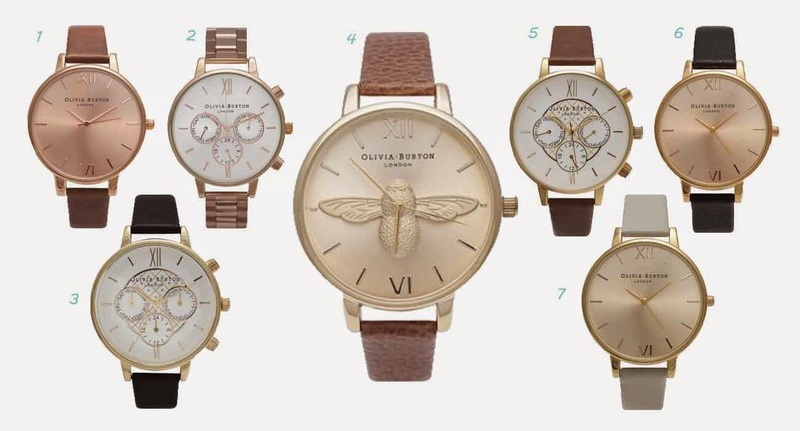 Olivia Burton watches have stolen my heart with their beautiful vintage style and simple elegant design. I have never been much of a watch wearer if I am being honest, I tend to just use my phone to check the time but these beautiful time pieces make me think it's about time that changed. The brand was started by two friends who just couldn't find what they were looking for when it came to watches. So what better thing to do than design your own, and that is just what they did. They have created a beautiful collection and there is a design for every occasion, and the light pastle colours would be amazing in Spring time. I feel that I have been looking at them for such a long time now but the problem is, there are so many that I love I just can't decide! I've put together some of my very favourite ones for this time of year, and while I can't decide which one I like the most. The bumble bee has to be one of them!